The BPPA’s 2018 College Contest is now open for entry. Entries must be received by 11:59pm on April 16, 2019. Here is the entry form and the rules and guidelines of the contest, the entry form, and a paypal button for paying the entry fee. You can also use the “pay now” button below. You do not have to have a paypal account to pay the entry fee. 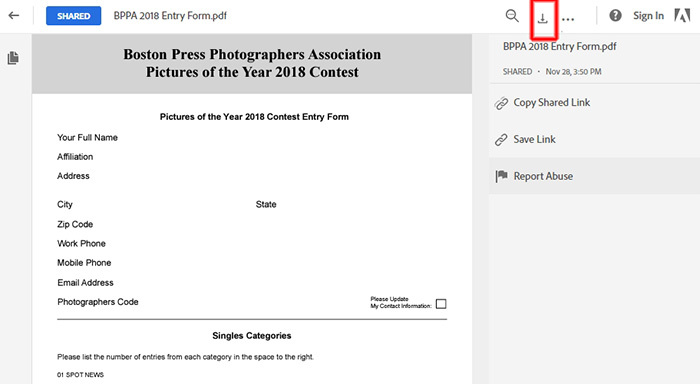 NOTE: To fill out the entry form, you must download the form using the button at the top right of the screen (see screenshot below) and use a program such as the free Adobe Reader software to fill it out and submit. For those of you who aren’t students, please encourage any students you know to enter their work. Good luck to all who enter. Check out the winning entries from 2017 to see what kind of work might win.